If you’re the one who everyone always turns to whenever they have a question about something, consider investing in Medl Mobile’s Pocket Reference. The $2 app contains perhaps everything anyone ever wanted to know about anything. M Is For Mobile: When you look up information with Pocket Reference, the app lets you know if a site is mobile-friendly by using a big blue ‘M’ icon. Pocket Reference uses Websites to create a mini-encyclopedia on your iPhone or iPod touch. Just pick a topic—anything from white pages, yellow pages, area codes, and zip codes to trivia and “of-the-day”—and you get a list of Websites specializing in it. If you’re not sure what your question falls under, just use the search bar. 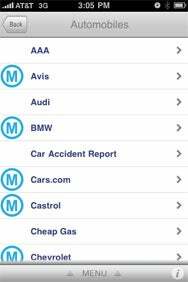 For extra help, Pocket Reference indicates which Websites are mobile-friendly with a giant, blue M symbol, so you can pick based on which ones are easiest to use on the iPhone. Despite the great things in this app, I was a little disappointed to see that it can’t work with the iPod running—that is to say, my music cut out when I was looking through the app. It isn’t a huge deal for everyday use, just a little annoying when you’re tuning out the city sounds on the bus, but also want to look up something quickly. It seems like Pocket Reference should be able to run uninterrupted, like so many other apps. Other than that, for $2, this reference app saves untold amounts of time spent fumbling on Google search. If you’re usually the one with all the answers, this is the app for you.